Supporting the immune system is vital in today’s world, which is why PFNC has added Venus Flytrap extract and capsules to our line of natural remedies. Your immune system resist both acute and chronic diseases and keeps your body functioning at optimal levels. Many environmental and emotional components can weaken your immunity making you susceptible to life threatening diseases. A healthy person is equipped with 1.5 kilograms (3.3 pounds) of immune cells. These cells include macrophages made up of white blood cells, T and B lymphocytes, natural killer cells, and plasma cells. Your immune system has a wonderful intelligence that is able to target invaders while preventing killer and scavenger cells from destroying healthy tissue and organisms. Immune suppressor cells have the power to increase the body’s ability to kill incompatible organisms and they work in conjunction with T-helper cells to balance immune system responses. The ratio between the suppressor and helper cells determines how powerful the body’s self-defense system is at any given time. In healthy people, the normal ratio is 1.2 to 0.3. Pollution, toxic overload, weak nutrition from eating a poor diet filled with devitalized and synthetic foods, and excessive stress can diminish our natural immunity. At PFNC we use several methods to support your immunity. Our newest is Venus Flytrap Immune Defense. Venus flytrap provides antipathogenic agents against incompatible organisms that attack the body. This remedy is a phytonutrient extract derived from the juice of the Venus Flytrap plant. Venus Flytrap Immune Defense supplements mimic the body’s own defense agents and support a stronger immune reaction. The supplements maintain the carefully balanced immune system mechanisms. This “enhances” the immune response in otherwise healthy persons who are suffering from stress, whether internal or external. 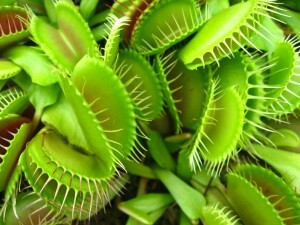 As you know, The Venus Flytrap plant is an expert at trapping its own meals through a sensitive biological response process. When a fly or other small insect touches the delicate hairs of the plant’s “mouth,” it causes the mouth to close quickly, trapping the insect inside the plant. The juicy liquids inside the plant’s mouth are capable of digesting animal and vegetable materials. Interestingly, they do not, however, digest the plant itself. Because of this the Venus Flytrap plant must have an advanced immune system capable of distinguishing between harmful intruder organisms and its own materials. The Venus Flytrap plant only digests the “primitive” undeveloped, undifferentiated cells of its own prey. These “primitive” cells are the same kind of cells that intrude into the human body. These primitive cells will proliferate as a result of chronic stress, exposure to pollutants and poor dietary habits, which the body’s immune system is programmed to attack. Supplementing the diet with the seventeen known inherent components of Venus Flytrap Immune Defense system supports the immune system multi-dimensionally by fortifying the body’s own defense mechanisms. The beauty and intelligence of this remarkable plant cannot be over-emphasized. It is nature’s storehouse of phytonutrients for the immune system. The major problem for people in westernized cultures is that we do not get enough of these essential nutrients from our current food intake. See Venus Flytrap Immune Defense Protocol.